Today – Just a Memory or Still Relevant? It is exactly 200 years since Jacques Offenbach and Franz von Suppè were born. This is reason enough to study the beginnings of a form of musical entertainment for the stage that has gone down in the history of music as Viennese operetta and that still enjoys considerable popularity nowadays. Viennese operetta developed as a foil to the reception of Offenbach’s operettas in Vienna in the second half of the nineteenth century. The essential features of these works, composed for audiences in Paris, are parody, satire and the grotesque, spiced with a dash of sparkling eroticism or even coarse frivolity. Although these ingredients were at first well received in Vienna, in the long run they did not meet with the approval of audiences and critics. 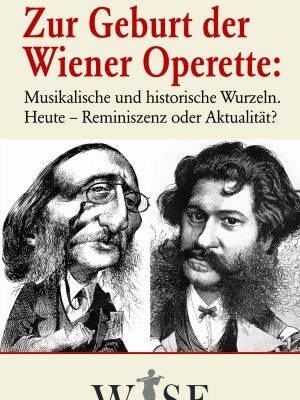 The earliest such productions in Vienna were still very much in the manner of Offenbach, but soon the Viennese were demanding their own form of operetta developed from local theatrical traditions. Recalling the old Viennese popular comedy, preferring the ‘home-grown’ over ‘foreign’ elements, integrating the Viennese waltz as a prominent feature, taking into account the tastes of the rising upper-middle class during a period of rapid economic growth, it was the first operetta by Johann Strauss II, Indigo und die vierzig Räuber (Indigo and the Forty Thieves), that finally provoked a feeling of relief in the Viennese media: ‘Strauss is just as unthinkable without Vienna as Vienna is without Strauss,’ Ludwig Speidel noted in his review of the premiere for the Fremden-Blattnewspaper on 12 February 1871. The most important of those composers who had paved the way for Strauss were Adolph Müller sen., Carl Binder together with the dramatist Johann Nestroy, Franz von Suppè, Carl Millöcker and above all Richard Genée. The genre has often been pronounced dead, but it still lives on. Which are the works that theatres put on their programmes? Can references to contemporary events and background be transferred to the present day? Is it worth striving to be faithful to the original and to respect and realise the authors’ intentions? Asking such questions leads to the ambitious goal of putting operetta on the stage in a way that is both topical and authentic. This is an aim which cannot be achieved without an excellent knowledge of the historical roots and of the works themselves. And yet the world looks towards Vienna, and people make their way to Austria so that here they can experience Viennese operetta in productions that are up-to-date and freed from the kitsch of past decades. Can we live up to these expectations?